I am not a “Doomsday Prepper.” While the list below seems long, most of it is stuff you likely have lying around anyway, just perhaps not well organized. Because friends and others have asked me for my list when this has come up in conversation, I’ve decided to just put it up here. This isn’t about building an underground shelter in your back yard. It’s just about what a prudent family should have prepared in the not-so-unlikely event of modern services simply being unavailable for a time. My assumption here is that this setup is for a family with a vehicle and home. It’s not meant to be some big all encompassing list for what to do while commuting should you need to eat fellow commuters if the train gets stuck. As a long time volunteer EMT, pilot, backpacker, etc., it’s just that over time I’ve come to collect what I believe to be the “table stakes” items one should have at home for basic self and family care. This isn’t just about terrorism paranoia. But stuff happens. Natural disasters; winter storms, hurricanes, disease outbreaks, etc. happen. Our brittle infrastructure risks long term power failures. And yes, there’s terrorism. It should be that a week or so without our usual services is just an inconvenience, not a life-threatening situation. Obviously, you have to adjust your own list for you own situation. I also understand that not everyone is into owning a weapon or wants to go to effort to get a pistol permit. Everything is optional. Everything depends on what you want / need. - If any kids: All kid stuff in 2nd pack. - All the gasoline cans we’ve got. - All toilet paper. Several paper towels. - Bicycle and bike pump. - Several rolls duct tape. - Warehouse club sized packs of AAA, AA, C batteries. - Several sheets of 4′ x 8′ plywood. - Screws / nails for plywood. - Make sure at least one grill propane tank is full. - At least two small propane tanks for camp stove. - Computers all backed up to cloud service backup drives. So you’re Microsoft. Windows 7 was fortunately usable as compared to some of the seriously flawed operating systems you put out just prior. But somehow the world has still changed. Macintosh is truly on a tear; likely due to users becoming more familiar with Apple in general via iPods, iPhones, iPads, etc. And sure, their OS in general is pretty damn good. Now you come out with Windows 8. 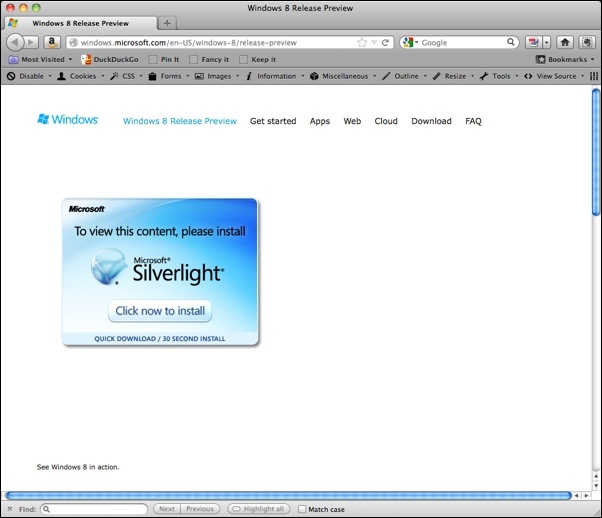 Maybe people are interested in taking a look, and you’re going to require Silverlight to see a demo? Silverlight? Which is on maybe 50% of browsers? THIS is what many will face when they go to look? They’re already taking some risk with such a radical re-thinking of their OS. Have the Product Marketing folks simply said, “Well, maybe most Mac users won’t typically have Silverlight installed, but… we’re not going to convert Mac users anyway, so let’s not worry about if they come here.” I’d love to get my hands on their analytics for this site and find out how many show up without the Silverlight Plugin installed. And how many actually bother to get it to come back. The fact that they both have their user hostile moments could be a reason why mass market consumer adoption may take much longer than it otherwise would for certain in home technologies. Sure, the penetration velocity of Smart Phones is stunning, especially as compared to other historical technologies. But where are we with the living room set top box? Or home automation, which could arguably save real money and offer some environmental benefits? Not very far. Why? Because for Core Important Items we Use All the Time, the Stuff Really has to Work. Somehow manufacturers stepped up to this challenge for mobile Phones, but still don’t get it for the home. It’s a scary thing. Even if you back up your stuff and you’re fairly sure you can restore it all after you get past this, there’s a moment of just “oh #@$” It’s not just about potentially losing data. It’s about all the TIME it takes to deal with such things. Couple this with the fact that the restore files are somewhat opaque. That is, your Contacts, for example. Sure, you can back them up to Outlook or Windows Contacts on a pc; but even these aren’t very accessible platforms. That is, let’s say I just want the file with the Contacts so I can save it in an online backup or an old-fahsioned thumb drive. It’s do-able. But you’re basically going to have to either install an App to help with this, or go through Outlook or Windows Contacts and then do an export or similar. This post isn’t about this or any other problem in particular. It’s about being CUMBERSOME. And that for day-to-day living, typical consumers fear these hassles; and rightly so. What customer who’s been PC based – which is still most of them – who is integrating Apple products into their life is going to trust something like Apple TV to work properly? Who will trust any of their boxes to integrate with other technologies; especially when a game console like the PS3 or Xbox can already do so much more; albeit at a higher price point? Meanwhile, let’s take a peek at some recent behavior from the people who brought us Windows ME and Vista, but at least seem to have Windows 7 working ok, and see how they’re doing in the home. The only place they exist besides perhaps a PC is the Xbox. And thanks to the genius of the Kinect system, they’re still alive here. And yet… will people adopt this system to do more? To control more of their living room or their home? Will people adopt the Xbox when Microsoft forces you to pay $100 / year to be a Gold Member in order to use a Netflix subscription you already pay for? Sony’s PS3 doesn’t force you to do that. And what about the Microsoft Credits to pay for On Demand shows or TV Series? Why not just use dollars? Someone in marketing probably realized the dollar costs are too high, so let’s figure out some other units. Then we can have bonus packs and giveaway’s and so on. Just one problem. You force people to have to do mental gymnastics every time to figure out what stuff costs. So they’re either going to abandon right there or finish the math and realize the stuff is radically overpriced. Maybe they’d even try the Xfinity service, IF they can get the Authentication Server when it’s in good enough of a mood to work. What Consumers with this kind of experience are going to want to embed such technologies further? Who wants to run more of their home services on Xbox vs. PS3 vs. (or in addition to ) AppleTV, etc., when what they already use is so clunky. Ever search for an App on the Apple App Store? It’s among the worst search experiences you can have with modern tools. And yet, Apple is King of the App world in terms of dollars spent. It’s amazing. Stunning. Ever try to pipe web content through a Windows Media Server to an Xbox to get around the fact that there’s not an open browser on the Xbox? Fun, huh? I do understand… deeply… and sincerely… issues of product roadmaps, product feature planning, market timing and so on. And some things unquestionably require market ecosystem maturity before release. Nevertheless, today’s modern ideas of Agile product development for the web does not necessarily translate easily to mass market consumer electronics and their associated service components. What constitutes “Minimum Viable Product” still requires a wide swath of related products and services to work well together. It all comes back to the time issue. And money of course. But time, which is essentially attention, is the most precious item in short supply now. Products will not break through the early adopter phase with these kinds of problems. But worse, having shown such problems to just about everyone, even when they are ready there’s quite possibly going to be a much longer adoption period. Simply due to lack of trust garnered from very real disappointing experiences. How can such problems be avoided? It’s simple. Make the stuff you put into the world work. Being a little faster to market than the next guy doesn’t help if the whole marketplace sector is tainted by bad experience from multiple vendors. Joshua Bell is one of the most talented violinists in the world. I think Lorenzo Laroc – in his own way – is as well. This is not really about one vs. the other though. It’s about this now old meme floating around regarding a lesson someone thinks they’re teaching about common folks’ attention to beauty in our world. I’ll place the whole urban legend story at the bottom of this note. But the short of it is Joshua Bell went to play his violin in the typical location of a street musician. Few stopped. The moral or message the researcher or sponsor of this social research seems to be trying to push is that we don’t easily recognize beauty in our midsts. Now, let’s instead take another example. Lorenzo Laroc. Laroc is also an accomplished violinist. However, Laroc has an intense rock and roll style using an electric violin. It’s new. It’s exciting. It stops a great many right in their tracks. I know this because I’ve seen him play many times at the entrance to the No. 6 train out of Grand Central Station, New York City. Where not a lot of people stop for hardly anything. In fact, in NYC, you can do just about anything at any hour day or night. Laws notwithstanding, there’s few rules people care about except for maybe one… Don’t Get in the Way. In this environment, people stop for Laroc. At least, in the beginning. As much as we may appreciate him, we don’t stop as much over time. Some of us have purchased his CD so we don’t have to stop on our busy way to work. Laroc seems to understand that he’s hitting a lot of the same audience and moves on as well. This is all common sense stuff, right? Why have I bothered to write this up? Only because it’s just a little pet peeve of mine when I come across false memes. I feel compelled to hold up a mirror to them for the few who might actually listen. For some reason, people like to pass around the story below because maybe they feel it tugs on some heart strings as well as the violin. (Yes, that was really bad. Couldn’t help it.) The reality is nothing is wrong with us at all. We recognize beauty just fine. We’re just not easily distracted when we’re in a clearly defined task. Unless there’s something truly novel going on. If there’s any lesson here at all, maybe that’s it. And now the story, verified by Snopes by the way. The one who paid the most attention was a 3 year old boy. His mother tagged him along, hurried but the kid stopped to look at the violinist. Finally the mother pushed hard and the child continued to walk turning his head all the time. This action was repeated by several other children. All the parents, without exception, forced them to move on. No one knew this but the violinist was Joshua Bell, one of the top musicians in the world. He played one of the most intricate pieces ever written,with a violin worth 3.5 million dollars. was organized by the Washington Post as part of a social experiment about perception, taste and priorities of people. The outlines were: in a commonplace environment at an inappropriate hour: Do we perceive beauty? It’s been years since I’ve read the original. This book is a must read if you have anything to do with marketing products of any sort to just about anyone. Does that seem a bit strong of an endorsement? Perhaps. Underhill may have written this book primarily to offer up insights into the retail marketplace and the mind and behavior of retail shoppers, (as well as promote his own business), but the insights are useful beyond these goals. One basic tenet for just about anyone marketing or selling anything is to “Know Your Customer.” Underhill’s depth of experience in this area is amazing. From simple day-to-day observations to the insights he draws from them, you can get a real feel for what’s going on inside a consumer’s decision making process. Most of what you’ll learn are the kinds of things that will just have you nodding and thinking, “Well, of course.” Nonetheless, there’s a difference between having a vague implicit feeling about something vs. having an explicit learning you can take and use for strategy and tactical marketing programs. If the book is lacking at all, it’s in a relatively scant coverage of the online experience and the still new ‘bricks and clicks’ aspects of operating both online and offline. Though the book has been updated for the Internet age, the Internet content is more of a gloss than the kind of in depth coverage a deep usability study of eCommerce or eComm coupled with retail would offer. No one can be overly faulted for this as neither strategies nor tactics in this area are yet clear as best practices. Though as of this writing, (in Winter, 2012), we know in excess of 60% of consumers use mobile devices to do research while in retail, we still don’t know exactly how various tools and techniques influence them. Just how useful are Quick Response, (QR), codes? Or regular bar codes leading to web sites? Etc. Etc. Even so, the overall feel for the consumer one has after going through this content should help light up some ideas as to what might be good things to test both offline and online. And at the intersection of the two. It’s been said that as online becomes wholly ubiquitous and always on, the distinction between online and offline will blur. This seems already to be true in some areas, (especially for content), but where actual physical goods, services or processes are involved, there will always be some grey areas. So the inflection points where such overlap occurs and the rate of change at which it occurs is still very much in question. With little historical data to provide guidance, going back to ‘knowing the customer’ seems like a good place to start considering how to craft such engagement points.